Whether you need a PAT testing training course, a PAT tester, PAT testing labels and adaptors or calibration, Quick Test can organise it for you. PAT testing in house is cost effective and can be carried out when it suits your business or organisation. PAT testing doesn’t have to be costly or disruptive. 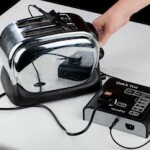 Portable appliance testing is easy with Quick Test. We hold the Quick Test PAT training course at various locations around the UK or at your own premises. Our trainers guide delegates step by step through the PAT testing process from regulations to actual PAT testing. On successful completion of the course the delegate will be awarded a Certificate of Competence in PAT testing. If you prefer you can opt for the self learning option with the Practical Guide to In-House PAT testing book. We even offer FREE telephone and e mail support to our delegates if they need it while PAT testing in their workplace. The Quick Test rechargeable battery powered microPAT comes under the category PASS/FAIL tester. The microPAT tester is quick, easy to operate, lightweight and has built in features to assist you. Quick Test offers a calibration service for the microPAT tester. This will ensure your PAT tester is measuring correctly. The accuracy of a PAT tester should be verified and recorded annually. If you have a specific question on Portable Appliance Testing you would like to ask please call or email us. 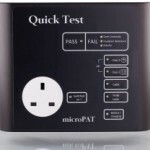 PAT testing made simple with Quick Test. We have designed and manufactured a fantastic user friendly PAT tester the microPAT to make your task even easier.click here for more information. PAT Testing Training with Quick Test is your first step to in-house PAT testing, click here for further information on PAT training and course prices.